Adjustable extra high collar with hidden drawstring stoppers. 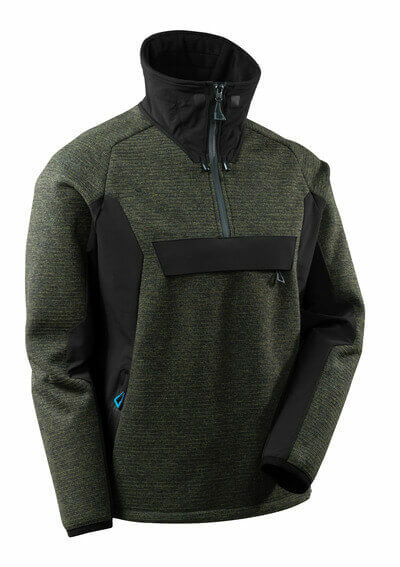 Three layer bonded fabric: knit outer layer, fleece inner layer for comfort, and a windproof and water-repellent membrane between. Breathable, windproof and water-repellent. Modern, close fit with great freedom of movement. Ergonomically shaped sleeves allows high freedom of movement. Ventilation under sleeves. Zip at the neck with storm flap. Chest pocket with zip. Front pockets with zip. High collar with adjustable drawstring. Elastic at cuffs. Adjustable elastic drawstring at waist. Stretch fabric at the sides. Reflectors.